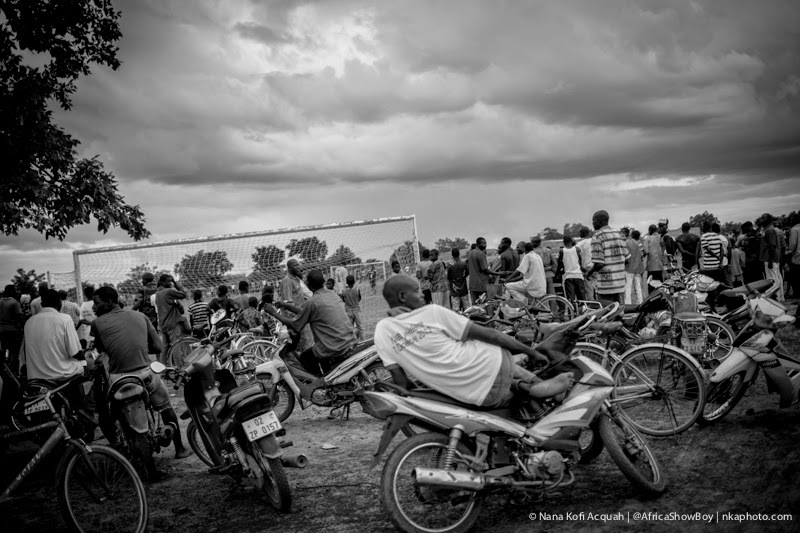 Photo: Men watching a game of football in Ponsomtenga, Burkina Faso (Aug 2014). Words also by Nana Kofi Acquah. The tragic hero is everyman. The frog in him finally buries the prince in him; if he’s not lucky. Days come when he can’t dare raise his eyes to look into a mirror because he knows the frog is poised and ready to barrage him with overwhelming evidence of his worthlessness: They both know what he’s done and where he’s been. Everyman knows what he’s done and where he’s been but must he allow that to define him? Is a man separate from his actions? Do the acts make the man? Do his whys matter? Everyman needs his world to believe he’s the prince he claims to be. He needs his spouse to know he can be trusted with her hopes, her fears, her heart- her all. He needs his children to know he is beacon and bright enough to point them in the way they should go. The crave for a resounding echo of his manliness and royalty on the lips of those he loves and respects is not just an ego thing. It’s an identity thing; for it is dangerous for a man to come to believe he is the frog croaking at him in his mirror, when he desperately yearns for affirmation that he is the prince. When the frog’s croaks crack through his night and desperate hours, the force of its hatred yanks everyman into the darkest corner of his cell; and the venom in the frogs voice weakens his will until he slumps in a defeated heap him in the faraway corner of his prison… and once again, he will need all the energy he can muster to come back out into the light, knowing full well that the frog will return. And deep down, it isn’t as much the return of the frog that scares him as his fear that he might finally believe what it says. It is sad to watch a man live his life, who has made peace with the frog in him. Everyman is spirit. Everyman is dirt. Therein lies his problem and his hope. He’s as comfortable in mire as a swine because mire’s what he’s made of; and yet he strives for the heavens like an eagle because he’s every bit spirit. But how can spirit and clay dwell together? Can fire and water share space? Can morning and evening sit at table? Everyman deliberately must choose a side in the war that rages on in him. It’s wise to choose the side that’s bound to win. The frog is loud. Its croaks will threaten to drown you many times over but the frog is mortal. The frog dies- with his struggles, addictions, accusations, guilt and nightmares. He dies. But spirit lives on. The spirit in everyman is the very breath of The King. The spirit never dies. It only goes back home. Must the prince not return to his king and his kingdom? And would you not he returned victorious? I am every man… and I choose to be prince.